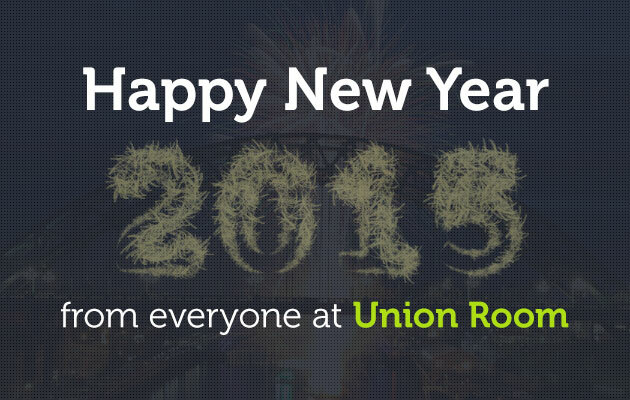 Happy New Year from all at Union Room! Hopefully everyone had a joyful festive period and enjoyed the New Year celebrations. We’re back in the studio this week, feet firmly hitting the decks running, picking up where we left off with projects old and new and looking forward to another fantastic year working with existing and (hopefully!) some new clients. There’s not going to be a dry moment in the studio throughout January – the creative juices are in full flow! It’s that time of year when people are making resolutions for the year ahead and laying down their goals and objectives. Our goals and objectives are always focused around managing and exceeding client expectations with a firm focus on learning and growing as a creative business. We’ve never taken anything for granted during our eleven year growth and we’re always keen to learn more about our clients and how we can help develop their businesses via our creative digital services. We’d love to sit down with you and chat about your online marketing goals and objectives for 2015 to see how we might be able to work together to achieve them. It might be that we haven’t spoken for a while, or now is the time for you to improve your web design, digital marketing, search optimisation or email marketing. Our services and case studies of success are always developing and growing, so it would be good to chat through some of these with you to see if there is any synergy with your business. If we haven’t yet collaborated then why not learn a little more about Union Room and the services we offer? We’re always looking to partner with businesses and develop mutually beneficial relationships. Why not get in touch and we can have a catch up or make acquaintance for the first time?